As you may or may not know, Marvel has its own branded credit card. It works as a MasterCard, so you're not limited to using it to only buy Marvel-related merchandise, but you can use it anywhere MasterCard is accepted, although you do get extra cashback rewards for shopping at Marvel and other entertainment venues. Interestingly, they launched with five different card designs and you could choose which you preferred. More interestingly, they began swapping out designs to tie in with other promotions. They had a Guardians of the Galaxy card available when that movie came out for example. Right now, they have a Black Panther design available, obviously playing in to the Black Panther movie release in a couple weeks. I actually know some people who work on the marketing for the card, and actually heard about this last fall. Nothing was final at that time, and they were debating whether to release a Black Panther design or a Punisher skull logo design. (The thinking being that a Punisher design would heavily cater to an NRA-type crowd.) I argued very strongly that a BP design would go over well, and that the movie is going to be a much bigger success than the marketing people are predicting. They said they'd take my argument under consideration, but whichever they went with wouldn't be available until January regardless. I hadn't heard anything on their decision after that, so I checked out the site a couple weeks ago only to find that there was indeed a Punisher design available. I was disappointed, and I had intended to write about that here today. 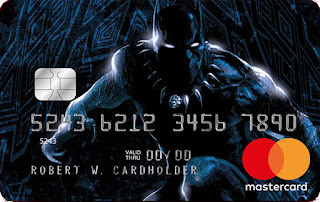 But when I did a quick Google search to get a card image, I spotted a piece of card art with T'Challa on it. I clicked through to Marvel's official card site, and indeed, there's a Black Panther design front and center! Apparently, they decided to launch both! So if I were you, I would take this opportunity to head over to their site and apply for a Black Panther credit card. In the first place, you'll be sending a message to Marvel that he's a better character than Punisher and, in the second place, it'll just look frickin' cool in your wallet!